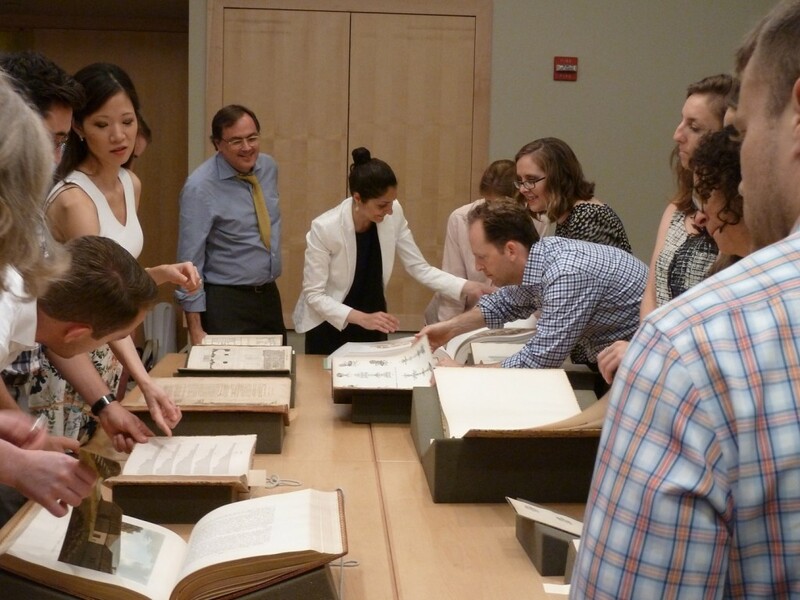 On June 24th , Avery Library welcomed the office of G. P. Schafer Architect for a viewing of materials from special collections.The evening focused on American domestic architecture, emphasizing the neoclassical and vernacular influences of interest to Mr. Schafer’s firm. Avery Classics presented a selection of books that a traced a narrative from the earliest American treatises on architecture through the heyday of nineteenth-century domestic pattern books and culminated in The House Beautiful, a volume designed by Frank Lloyd Wright for a text written by the Unitarian minister, William Channing Gannett. 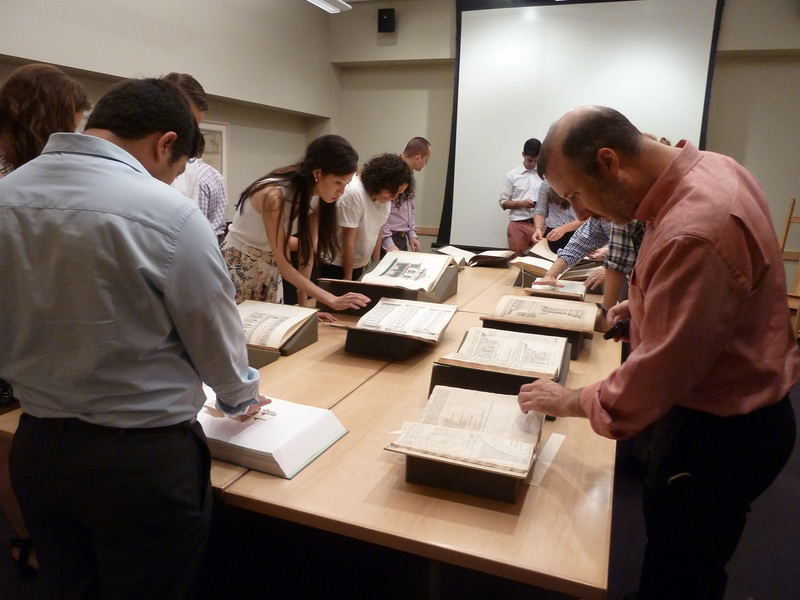 Drawings & Archives featured an in-depth look at drawings and photographs from the archive of Charles Platt, one of the leading practitioners of American neoclassicism and architectonic garden design at the turn of the twentieth century. In 2011, Mr. Schafer’s firm renovated Boxwood, a residence designed by Platt almost a century earlier outside Nashville, Tennessee. This entry was posted in Avery Classics Collection, Drawings & Archives, Exhibitions on June 29, 2015 by Ted. Sylvan Cemetery: Architecture, Art & Landscape at Woodlawn received “The ‘Victorian Society New York’ 2014 Exhibition and Catalogue Award” at ceremonies held at the New York School of Interior Design on June 3, 2015. Charles D. Warren and Carole Ann Fabian accepted the award on behalf of the project team. In brief remarks, Ms. Fabian (Director, Avery Architectural & Fine Arts Library) thanked the Boards of the Woodlawn Cemetery and The Woodlawn Conservancy for their encouragement and support, which helped to bring the exhibit and catalog forward. The Victorian Society Award honors the collective efforts of co-curators: Janet Parks, Susan Olsen and Charles Warren; catalog authors: Andrew Dolkart (Columbia- GSAPP), Alice Frelinghuysen (Metropolitan Museum of Art), Charles Warren and the late Cynthia Mills; and Deborah Cullen and Jeanette Silverthorne of the Miriam & Ira D. Wallach Art Gallery. The Sylvan Cemetery exhibit at the Wallach Art Gallery (September 3-November 1, 2014) marked the 150th anniversary of Woodlawn Cemetery and celebrated the Cemetery’s 2006 gift of its archive—the most complete set of 19th– and 20th–century cemetery records held in the public trust -– to the Avery Architectural and Fine Arts Library. 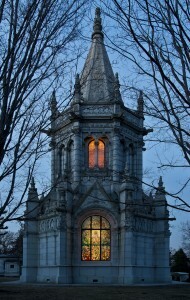 Sylvan Cemetery highlights the renowned architects, artists, artisans and landscape designers whose work has come to define The Woodlawn Cemetery, which was designated a National Historic Landmark in 2011 for the significance of its art and architecture. The award-winning exhibition catalog, co-published by Columbia University’s Avery Library and The Woodlawn Conservancy, is available for purchase online and to libraries through Worldwide Books. This entry was posted in Drawings & Archives, Exhibitions and tagged Sylvan Cemetery, Woodlawn Cemetery on June 8, 2015 by Ted.